As I was driving to Val Caron the other morning on a business trip, I spotted this lovely scene with Tamarack trees. I thought to myself that this would be a worthwhile opportunity come evening. Thus I made an early supper, loaded my gear and headed out. I drove to the Notre Dame, Lasalle Blvd corner and headed North onto Regional Road 80. A few kilometers on I parked by a small body of water. The Tamarack were a nice yellow, orange color in the low light. The sky had a touch of pink in it. I needed some foreground for a better affect. There was a huge transmission tower at the back of the scene. I sure did not want that. It was even reflecting on the water. I then spotted a Tamarack to the South. I headed over there and set up my tripod. I mounted my 28 to 135 zoom lens to my Canon 7D. I was all set to go. The traffic was fairly heavy here, but the shoulders of the road were wide. The lighting was retreating fast. So now I composed with a small portion of a point that contained the Tamarack for my foreground. 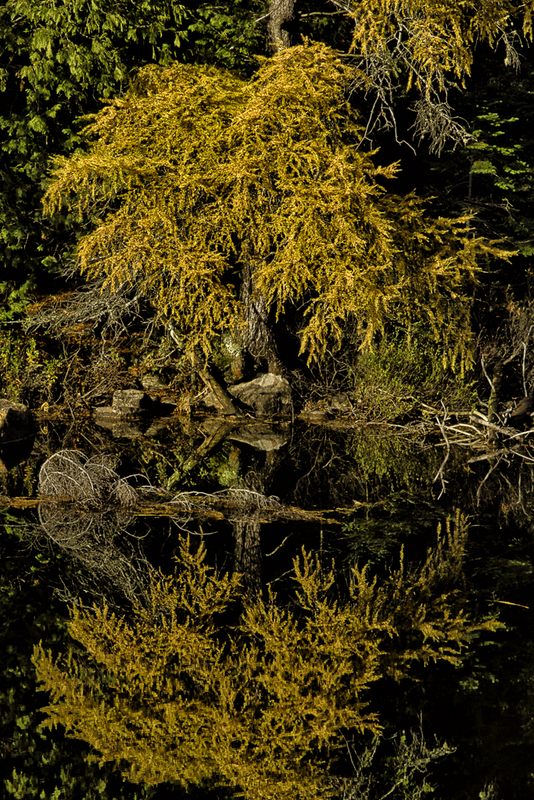 The reflection of the Tamarack filled the bottom right corner of the photo for a lead-in. A beautiful collection of colorful Tamarack in the middle ground. The darker evergreens allow the Tamarack to stand out better. There is one little white cloud on the horizon. Being late in the evening there is a pink glow in the sky and water. All of this within the City of Sudbury. Thank you for stopping by. Tonight I am off to the Sudbury Arts Council for Arts After Five at the Art Gallery of Sudbury Wednesday at 5 pm. It is a networking for artists and art patrons. There will be music by Sweet Jive, refreshments, and door prizes! This is the time of year that the Tamarack are in their full Fall color before shedding.Tamarack are a species of Larch that is native to Canada.The name Tamarack is the Algonquian name for the species and means “wood used for snowshoes“.The leaves are needle like and turn bright yellow before falling in the Autumn.The Tamarack are commonly found in swamps, bogs, and other low-land areas. Gerard Leduc arrived shortly after 7:00 A.M. and we were soon on our way to the Westbranch North of Webbwood in Northern Ontario. A quick stop for gas at the Espanola turn-off and a couple of Tim Horton‘s coffee to start the day,we were soon traveling up the Westbranch searching for Tamarack to photograph.There are lots of Tamarack to photograph but find a composition to work. We stopped at Gordon Chutes at the 20 km mark and Gerard took a few shots of the waterfalls.The falls is part of the Wakanashing River.We continued North photographing as we went.At the 70 km area there are a few lakes to photograph by the road.The moose hunters were out in full force.That meant we had to wear orange jackets for protection. Since the last rains the water levels of the various creeks had risen,but still not a normal levels.As we drove along we spotted a male Spruce Grouse doing his display.I pulled over so that we could observe this very pretty bird in all his glory.There must be a female nearby.A large creek was now running along the West side of the road.I spotted the Tamarack on the far creek bank. Pulling over Gerard and I set up the tripods and cameras to start photographing.It was a cloudy morning with the sun coming out now and then.I opted to do a close up shot of the bottom of the Tamarack and the resulting reflection to create my composition.There was a nice pattern to be had here.It was just a matter of waiting for the sun to pop out and light up the leaves,turning them a golden yellow.The sun would go back behind the moving clouds and one would wait once again for it to come out again.The thing is you do not want to much sunlight or you will blow out the highlights.